Why do my tomatoes crack open after starting to turn red? They never get very big. It may actually be inconsistent watering. Tomato plants need to get the same amount of water consistently through out their life to do well. If you water them differing amounts, or you get a hot streak, or you get a dry spell, or you get downpours for days, (you get the idea) they will crack. Hope this helps. 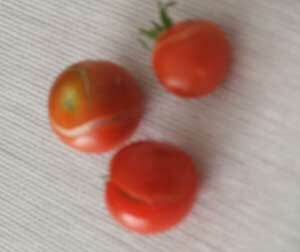 Tomato Cracking is usually from excess rainfall, or from hand watering from the top of the plant. Tomatoes prefer to be watered at the bottom, ie, drip line, bubbler, running hose, etc. Watering from the top during the day, makes the tender skin crack from the excess heat, (it's like basting them) and watering from the top during the evening can harbor or otherwise encourage diseases of various kinds to take hold. Water the roots, not the plant for crack free tomatoes. Why are my tomatoes cracked and yellow on a small part of the top? Could someone please tell me why my tomatoes are cracking? Tomato plants when growing the fruit are particular boogers. These are stress cracks. These cracked because of one of several reasons. Cracks usually occur after the fruit has reached its full size and is in its ripening stage. Extreme high temperatures for a number of days while ripening can cause this. Another reason might be because they need to be kept at the same moisture level for the time they are bearing the fruit. They need watered everyday unless it rains. Also, never put water on the leaves in extreme heat (unless mother nature does it). I learned this from a older lady who use to run a green house. Hope this helps. This article explains that allowing tomatoes to ripen on the vine can cause cracking. Hope it helps. Even fertilizer and watering across the whole growing season should eliminate this problem.